Car Review: Does the new Genesis G70 have what it takes to win in the small luxury sedan class? Competition beware, Genesis makes its move on the compact luxury sedan class. The latest luxury car brand Genesis looks to move the market with a sporty luxury sedan and takes aim at the leader. When you think of a compact luxury sedan, is the first car you think of a BMW 3 series? It’s the stalwart of the class and many manufacturers do their best to make a better Bimmer. Some have come close but have never put it all together. Now Genesis, the luxury car brand from Hyundai, jumps into the fray with a new entry: the G70. I spent a week with the G70 2.0T Sport, which was named the North American Car of the Year. After just few miles behind the wheel, I could see why. Driving dynamics are more a German sports sedan than you could imagine. My tester was a RWD model, but AWD is available for about $2,000 more. Prices start around $35,000 but the tester came with all the options so add another $10,000, which is still thousands less than the competition. With that extra cash the G70 has performance goodies like summer tires and limited slip differential that help with stout handling limits. But the G70 is good as a daily driver with a comfortable ride on most surfaces. The larger optional wheels with low-profile tires let some bigger bumps be known. While the 2.0T four-cylinder engine is the base engine good for 252 horsepower, the G70 seems very eager when accelerating. It might not sound as good as some other turbo four-cylinder engines in this class but that’s really a minor ding on the car. The power is available at lower revs and there doesn’t seem to be any turbo lag either. A smooth eight-speed automatic turns to a quick and firm shifting transmission when pushed. The G70 can even be had with a manual transmission, which is rare these days. A large array of safety equipment comes standard even for the low base price. While driving the G70 2.0T Sport was great, the interior was just as impressive. The materials are top notch — especially with $10,000 in optional packages. Nappa quilted leather seats are comfortable and offer heat and ventilation up front, as well as heated rear seats. Front seats have ample power adjustments to get the proper seating position. Rear seat riders have limited space. Those under 5’8″ should find it usable; taller people will find it tighter than a few others in the class. The trunk is also on the smaller side, but the rear seats fold to allow for larger cargo when needed. A wide power sunroof that lets in lots of light and the Microfiber Suede Headliner is a nice touch to class up the interior. The 8-inch touch screen is what you would find in Hyundai models but it works well even if it doesn’t have as good of graphics as some other competition. There’s no compliant about the surround view monitor when you’re parking or pulling out of tight spaces. The Lexicon surround sound system has a really full sound for such a small car. There isn’t much wind or road noise, so you can hear the clarity of those 15 speakers easily. Other Genesis models I’ve looked at in the past have been conservatively styled. The new G70 is more daring. While it’s not earth shattering, it’s a nice change for Genesis and it no longer gets lost in the crowd. The smallest Genesis has a sportier, hunkered-down appearance, like a sport sedan should. A large grill and dark chrome trim pieces add to the sportier look. Cool-looking LED lighting with cooper accents adds a unique look and flair. Large black 19-inch sport wheels practically scream sports car and they work nicely with the Santiago Silver paint. Along with those large wheels, the side profile reveals no wasted metal on the G70; the wheels seem to be pushed to the edges of the small sedan. The back of the G70 is clean with no big wing to spoil the lines, just some tinted taillight clusters and chrome exhaust tips add a hint of sport. 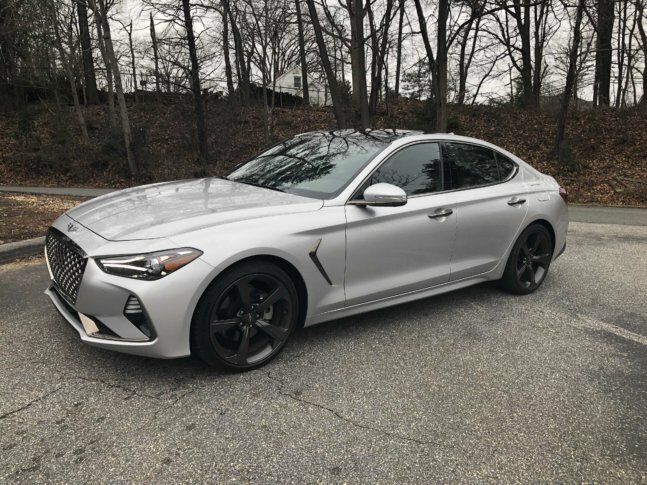 The new Genesis G70 is a very good compact luxury sedan, one that combines performance with all the premium features that buyers are looking for. While Genesis might be a new brand they sure offer value for your buying dollar, making other luxury cars makers a bit nervous in the process.